I was born in Seattle, Washington, in the year 1910, of normal parents. 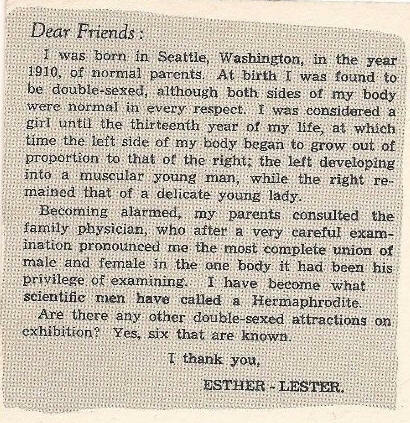 At birth I was found to be double-sexed, although both sides of my body were normal in every respect. I was considered a girl until the thirteenth year of my life, at which time the left side of my body began to grow out of proportion to that of the right: the left developing into a muscular young man, while the right remained that of a delicate young lady. 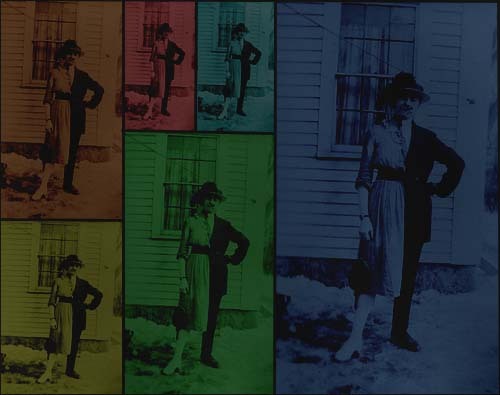 Becoming alarmed, my parent consulted the family physician, who after a very careful examination pronounced me the most complete union of male and female in the one body it had been his privilege of examining. I have become what scientific men have called a Hermaphrodite.